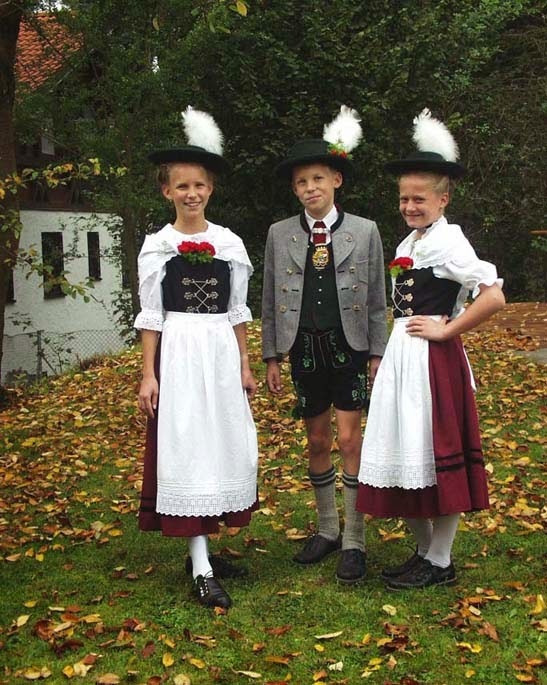 Today I am going to focus on the Miesbach costume. 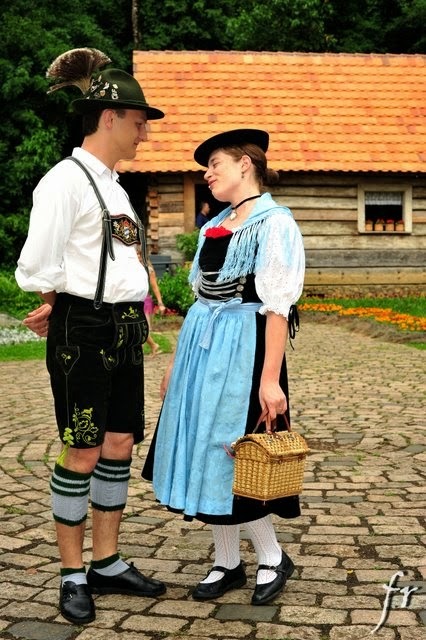 This costume has become a symbol of Bavaria, of Munich, and in fact, of Germany as a whole. 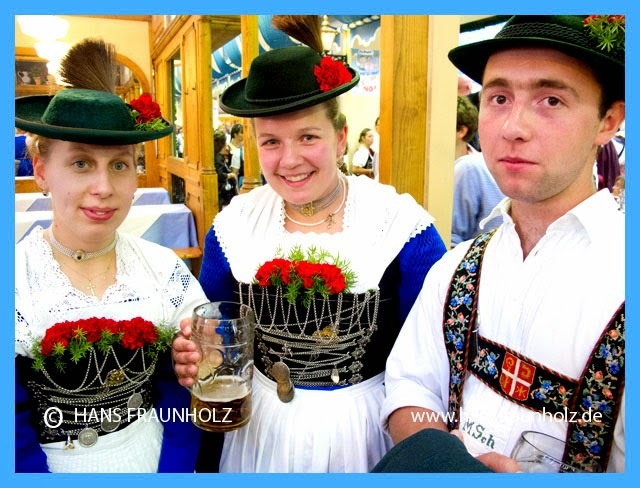 It is actually from south central Upper Bavaria, the area known as the Tölz-Miesbach Upland, between the Inn River in the east, the Ammer River in the west, the Austrian border on the south, and the environs of Munich in the north, covering the Landskreise of Toelz, Miesbach, and the western half of Rosenheim. 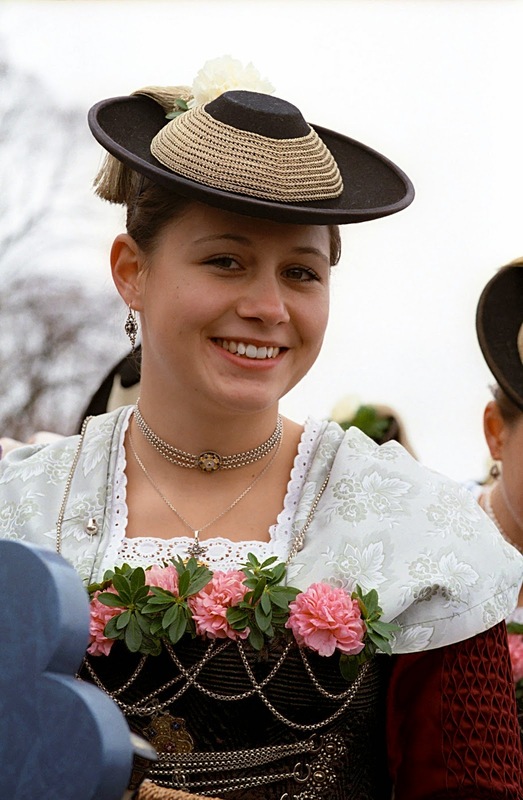 However, it is also strongly identified with Munich, and is widely worn in all of Bavaria and beyond, and often considered to be more than a regional costume. 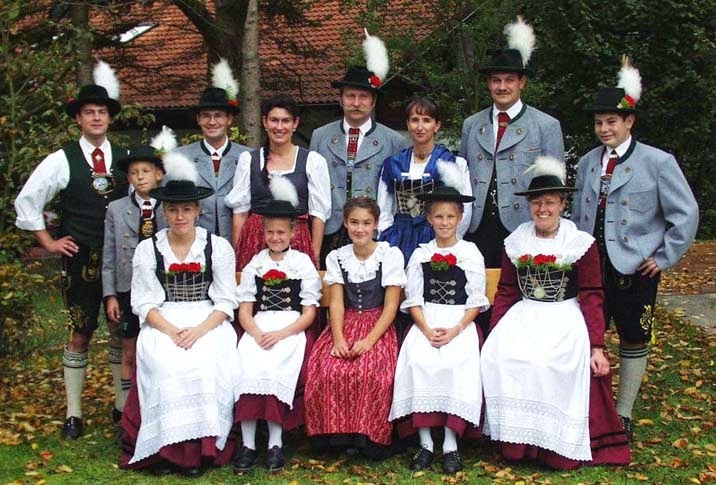 This is not a living costume region in the historical sense, as are, for example, Ochsenfurt or Schaumburg. 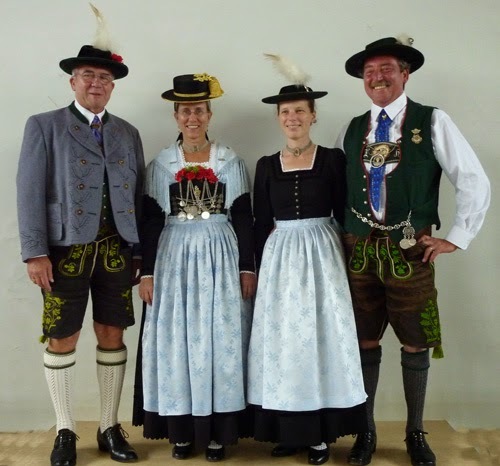 The modern Miesbach costume was codified by the local Trachtenvereine in Miesbach starting in 1900 or so, and then other Costume groups in the region joined in to help develop it, up to the 1950's, and indeed the various local groups continue to refine it today. This is not to say that it was invented out of nothing at that time, it rose out of a desire to reclaim the clothing heritage of the area, but also to modernize it for a new era. 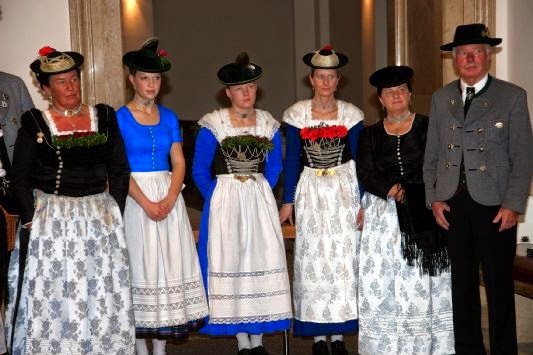 There was much source material available, and so this must count as one of the most successful rebirths of a regional costume, as people began to value it as part of their heritage, rather than to disparage it as the outmoded clothing of country bumpkins. 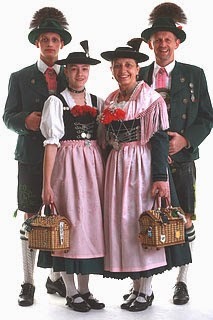 This is one of the few folk costumes which one can buy off the rack in department stores. 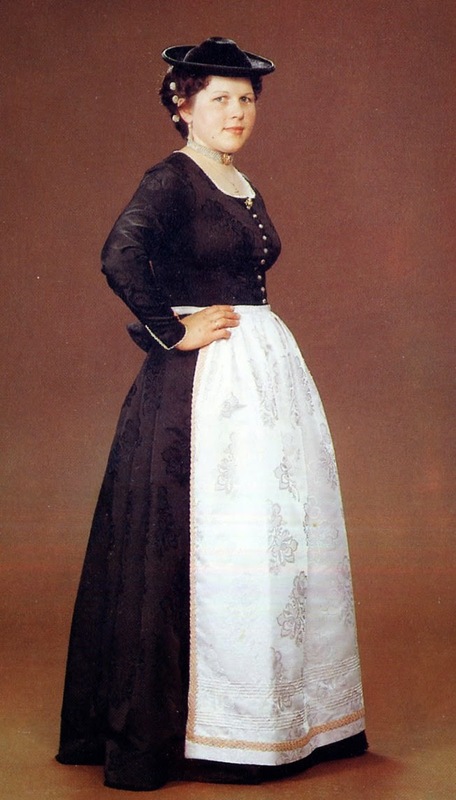 Here is an image painted by Albert Kretschmer in the latter mid 1800's of the costume as it was worn at that time. We do not know the exact year that it was painted, but it was published somewhere between 1877 and 1890. 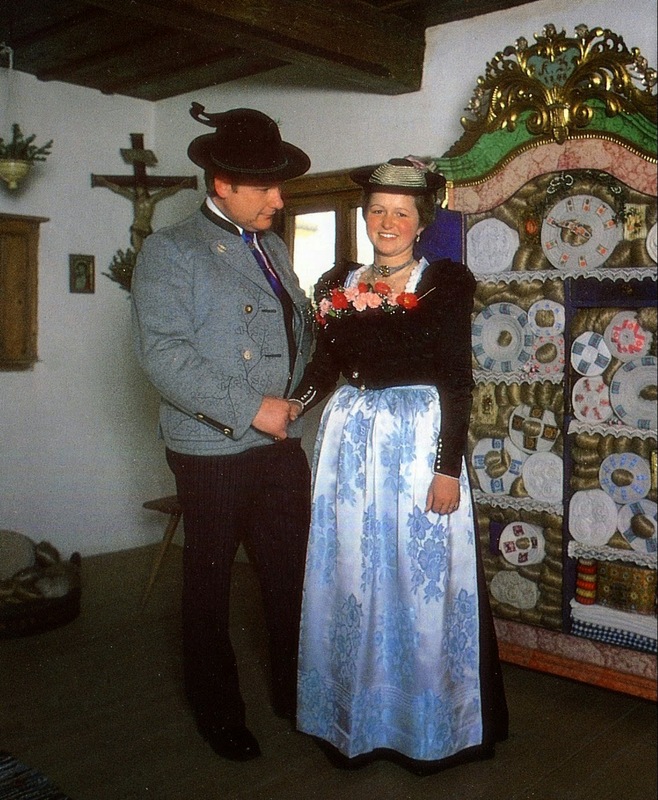 There is continuity and yet many differences of detail when compared to the modern Tracht. 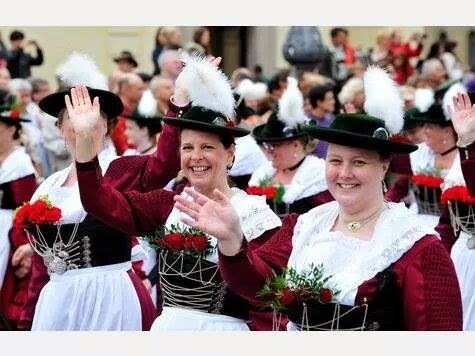 The photo at the head of the article shows some members of the German American Society here in Omaha who were invited to take part in the Oktoberfest activities in Munich, which few groups outside of Germany have done under official auspices. Here is another photo of that group.. 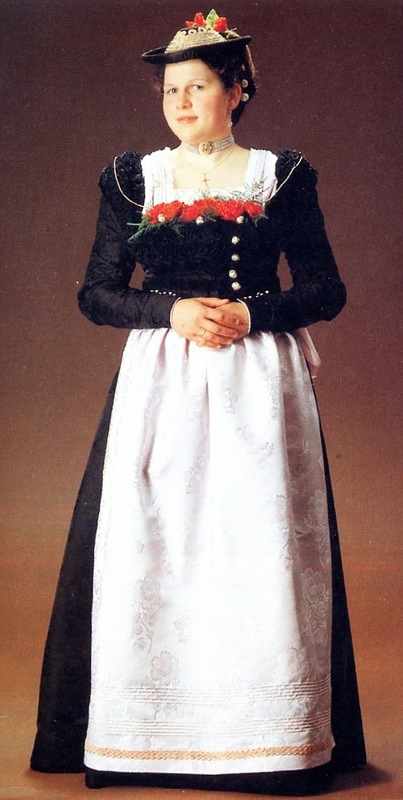 There are several versions of this costume, appropriate for occasions of varying solemnity. The version pictured above is perhaps a medium level, appropriate for Sunday services or a festival. I will be presenting the various pieces with the help of my friends Orest and Sara. 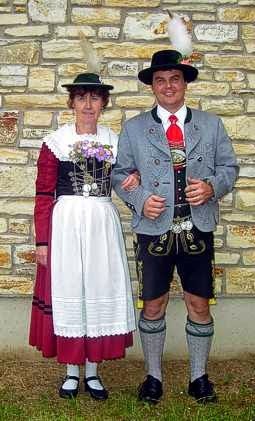 also members of the Omaha German American Club who agreed to pose for a series of photographs. 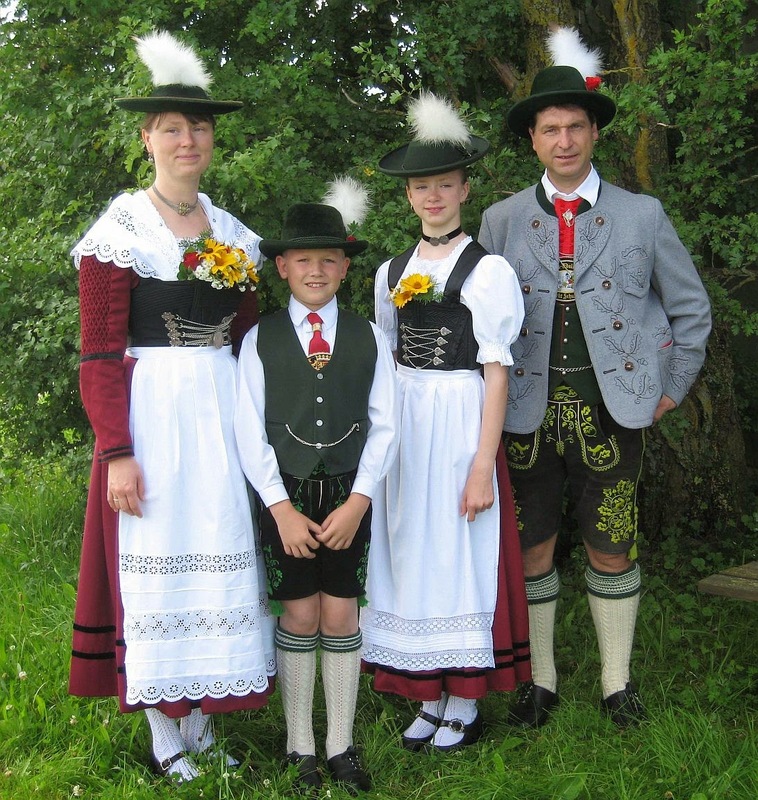 They wear the variant of the Tracht which is used in Wolfratshausen, in the northwestern corner of this costume area. 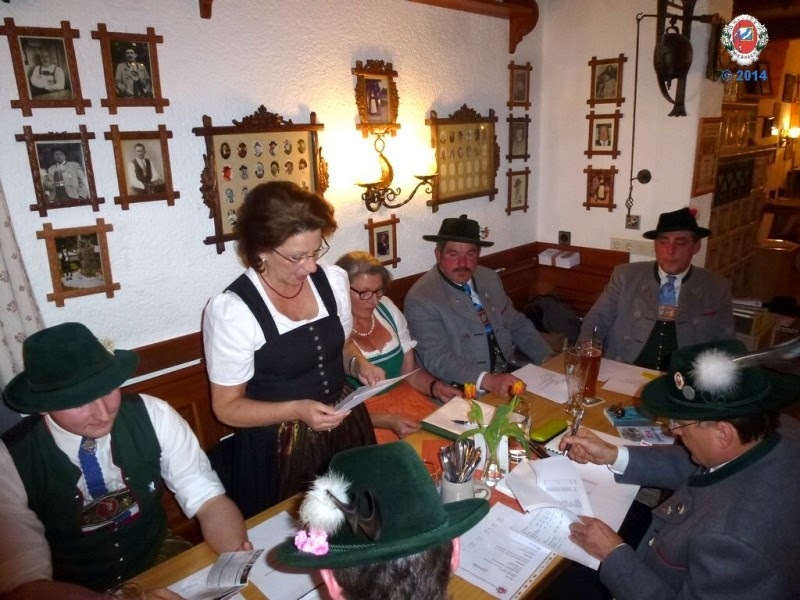 This is the Gwand with Mieder and Weisswasch. Originally the foundation garment was a linen chemise, of which only the collar and cuffs were visible in this version of the costume. In the course of the development of this costume in the 20th cent. 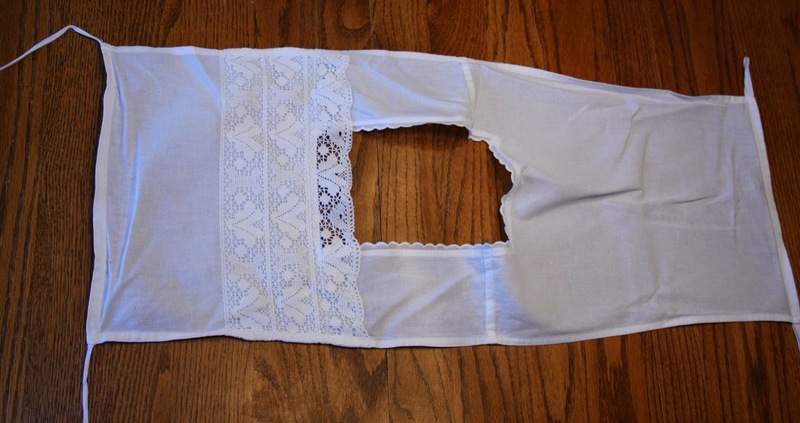 The chemise was cut in two, forming a petticoat and blouse, and then the blouse was reduced to a dickey, called Schmiesl [Chemise-l, little chemise]. The only part of this which shows is the lace around the color and the linen around it. The ties on the front corners pass through the loops on the back corners, and then are secured around the body, similar to the Dutch kraplap. Here is a closeup when fully dressed. The bottom half of the chemise is now the petticoat, which today is worn over bloomers. 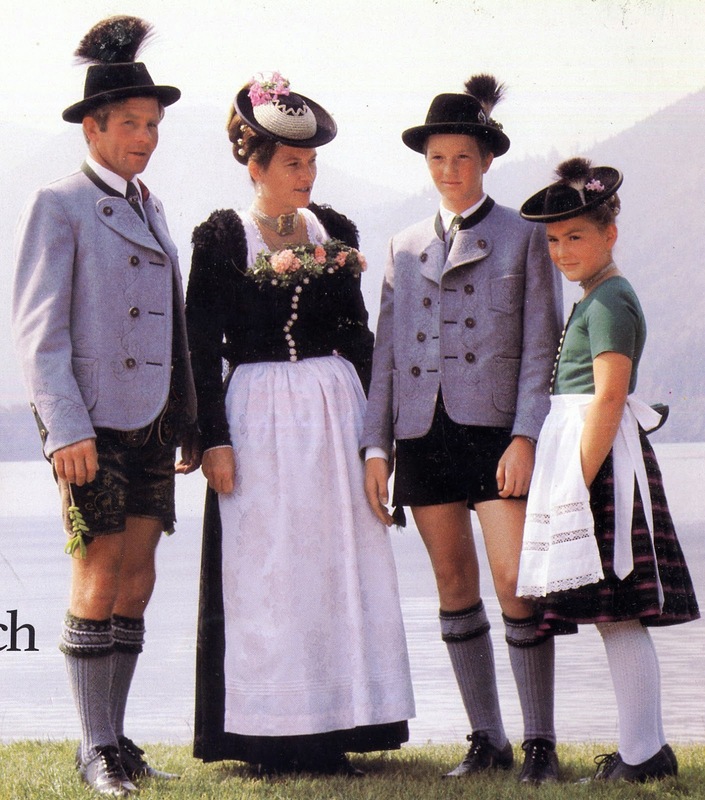 As in many places, more than one petticoat, and even an underskirt may be worn. 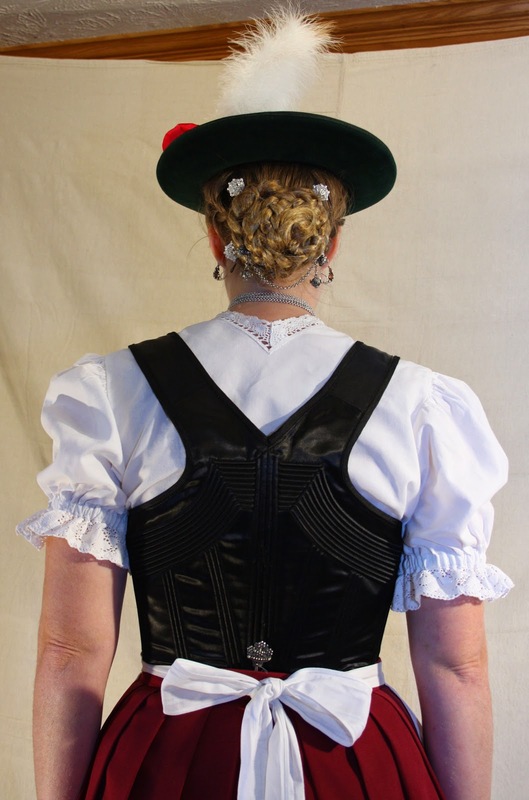 The Spenser jacket was extremely common in central Western Europe at this time, but here in this costume it has migrated inside the bodice, and is worn just over the chemise, and later the Schmiesl. In the print by Kretschmer above, you can see that it has the typical leg of mutton sleeves which are smocked on the upper arm. 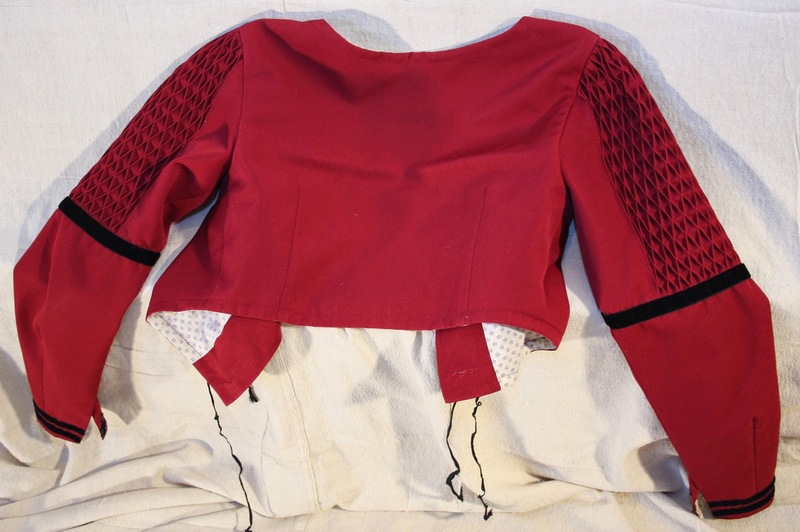 Today this garment is called Janker, and the sleeves have been modified; the upper smocked portion is sewn separately, and set into the armhole with a capped sleeve. The lower portion is quite narrow and there is a seam between the two. This results in the sleeve lying smoothly and closely along the arms when lowered, but also results in a significant lack of mobility. 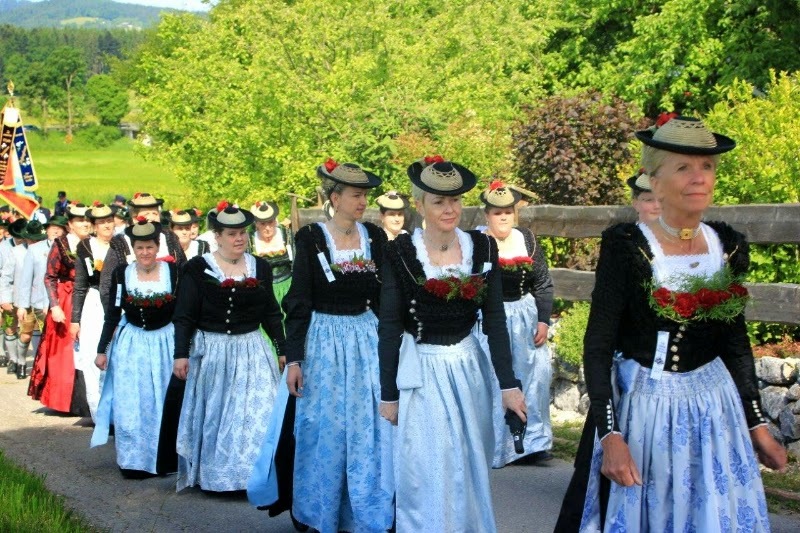 The Janker is always made of the same material as the top skirt, today usually a solid red, green, or blue, but in the past, as we see from Kretschmer, it was also made of flowered material. Here are front and back views. The modern Janker is quite short, not reaching the waist, which is why I do not have a photo of Sara wearing it without the bodice over it. 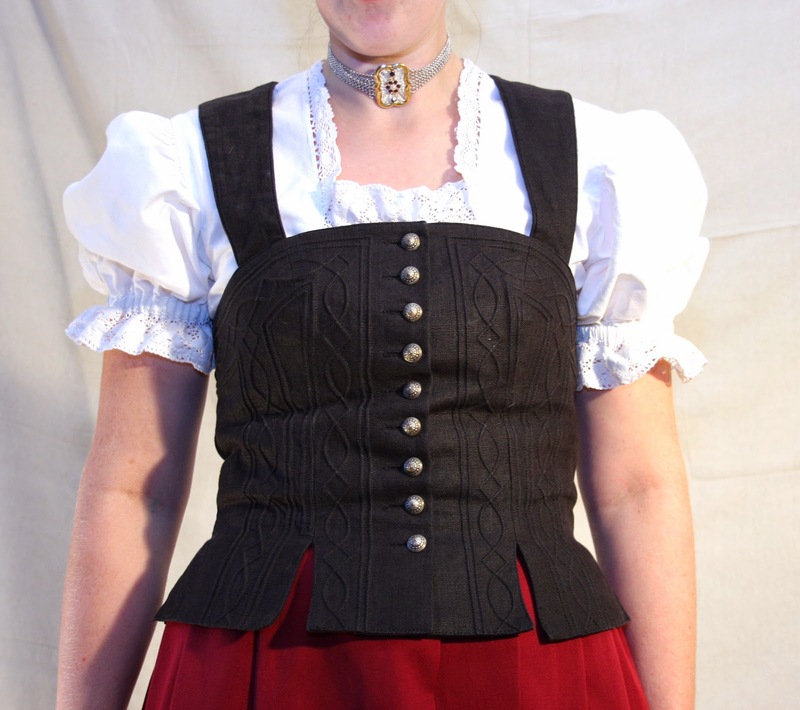 Over the Janker is worn the Mieder, the bodice. 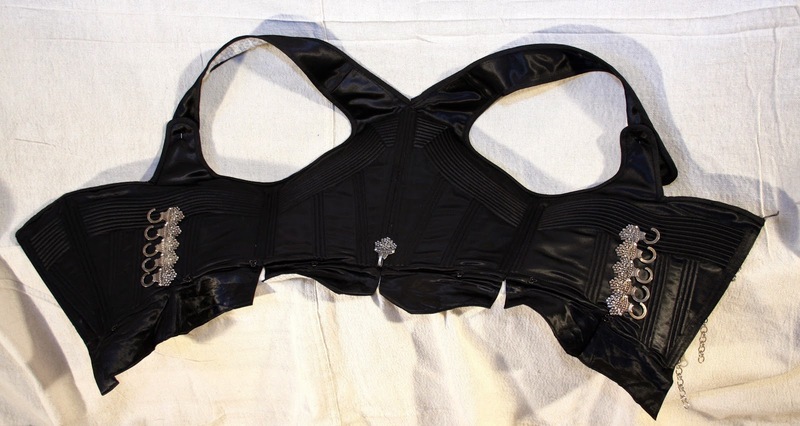 This is generally made of black satin, is boned and stiffened with quilting and cording in many subtle patterns. It closes at the side front with chains and hooks. On the sides are two rows of silver hooks. A chain is threaded through these open hooks back and forth, the pin on the leading end being tucked in behind the threaded chain. 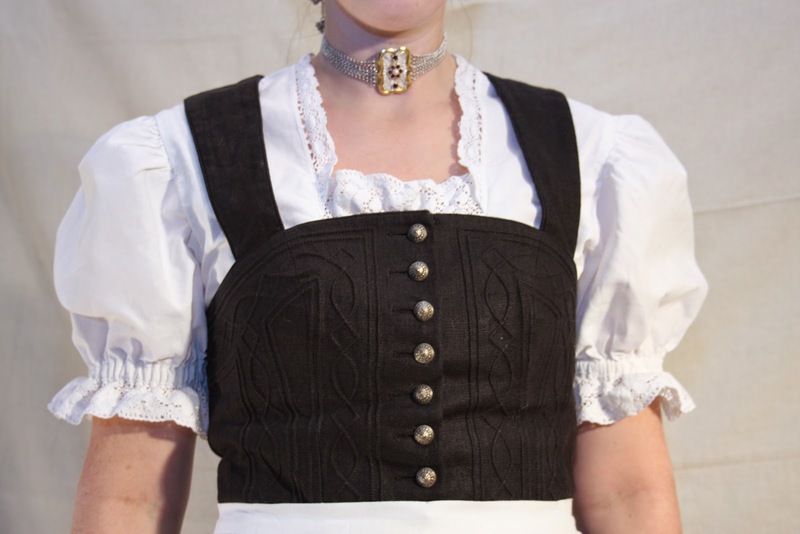 Generally the chain is quite long, and is often looped over several pins inserted into the top front of the bodice. 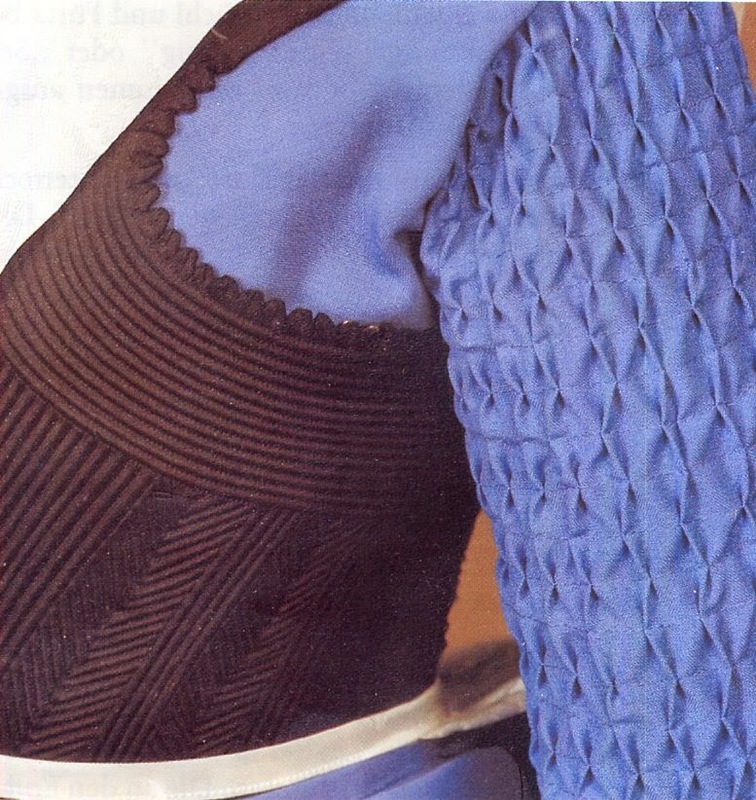 Sometimes it is even looped around the pins which fasten the shoulder shawl and loops right around the shoulders. 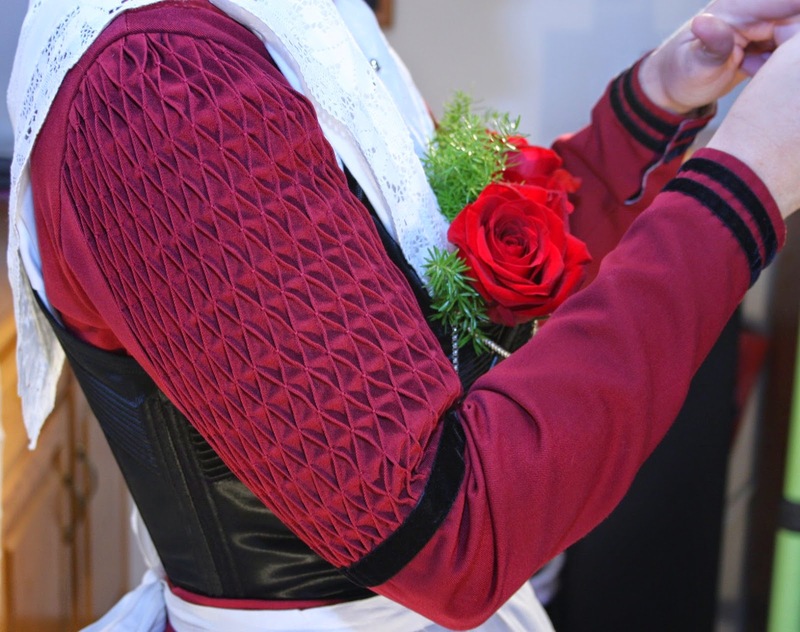 Usually flowers and asparagus fern are inserted into the top of the bodice. If you look closely at this image, you can see the opening just to the right of the first rose. 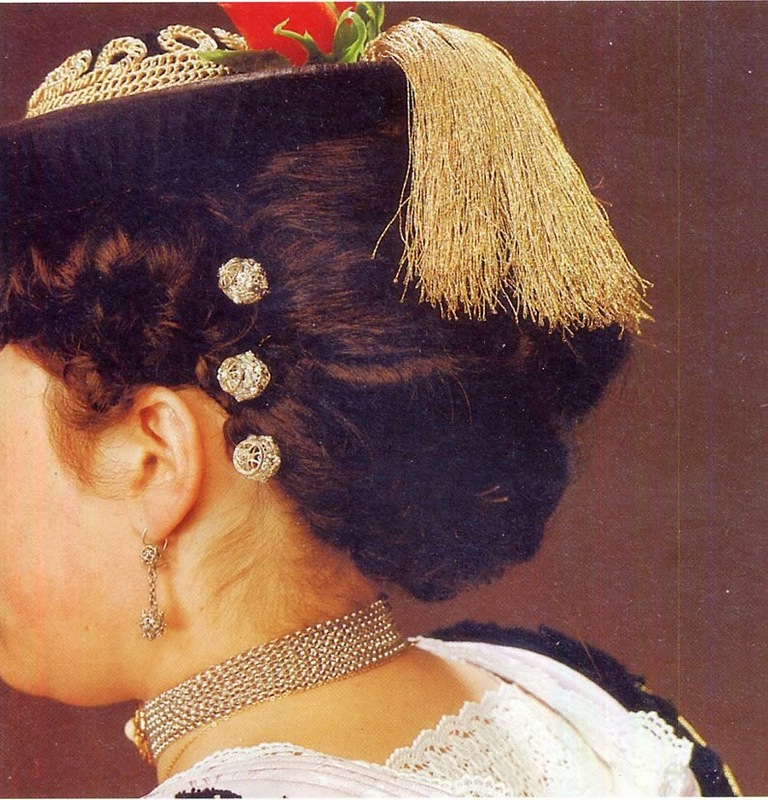 There is an ornamental hook in the center back, over which is hung a loop attached to the skirt. There are also hooks and eyes around the waist which help support the skirt. 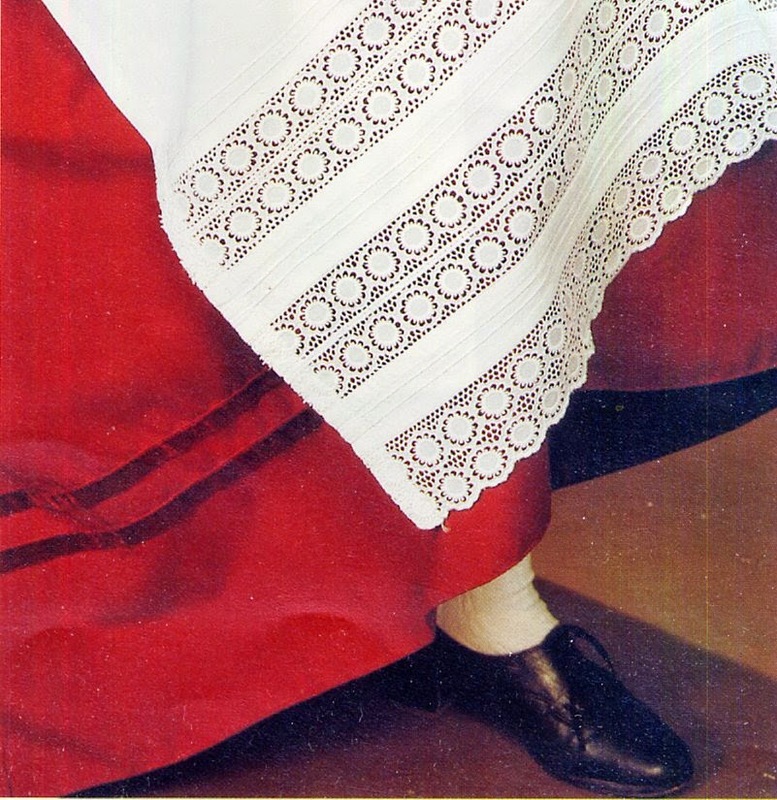 The Mieder has lappets which are worn under the skirt. 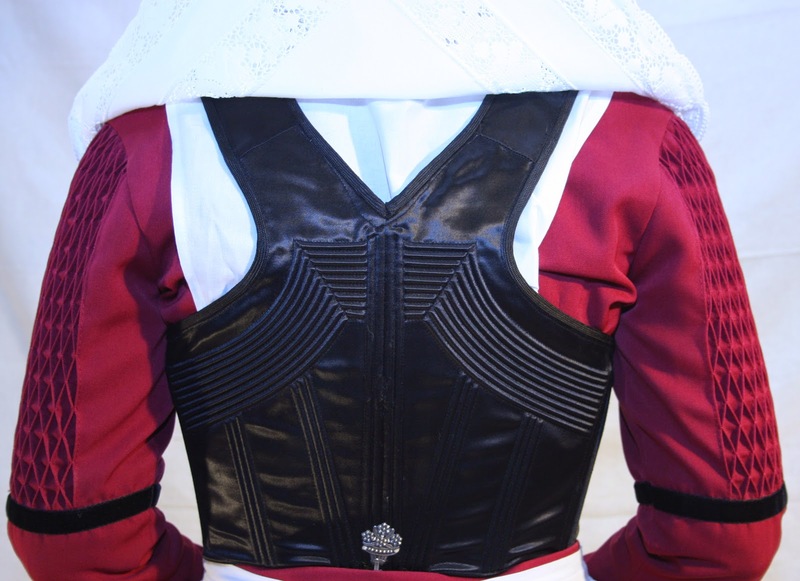 The straps over the shoulders meet in the center back, and are pinned near the front. 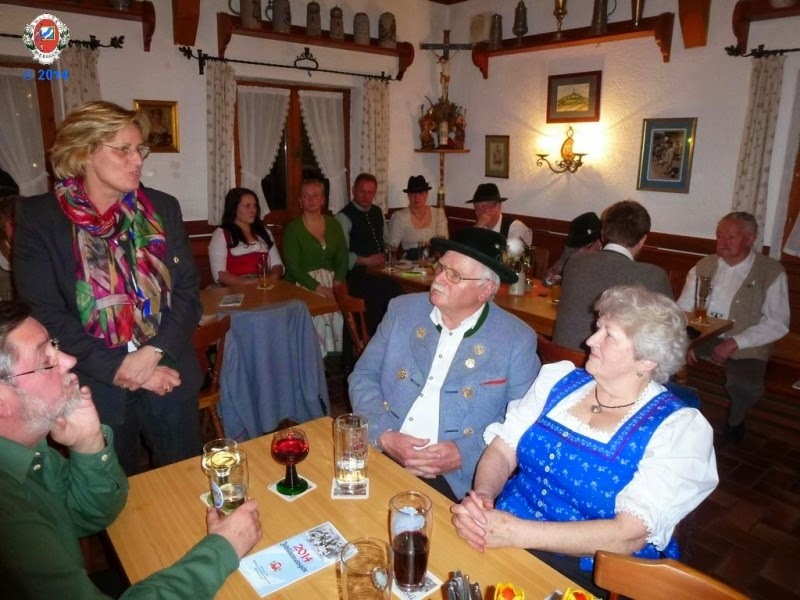 We see here that Sara has chosen to wear the Schmiesl over the Janker. Click on any of these images to see more detail. 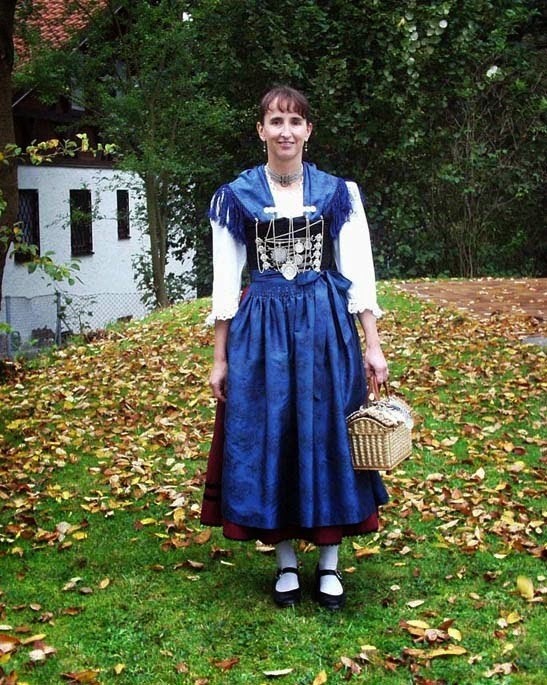 This is a link to an article in which a woman describes the process of sewing her own Mieder. 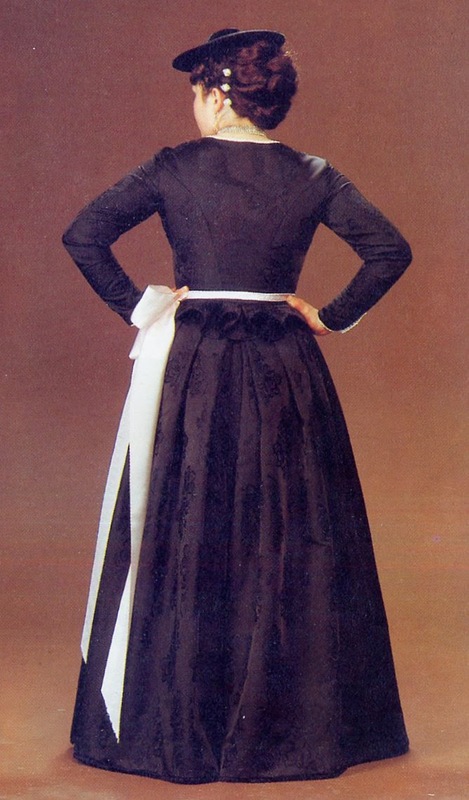 The skirt is of wool, has deep folks at the waist, and generally has dark ribbons sewn on above the hem. 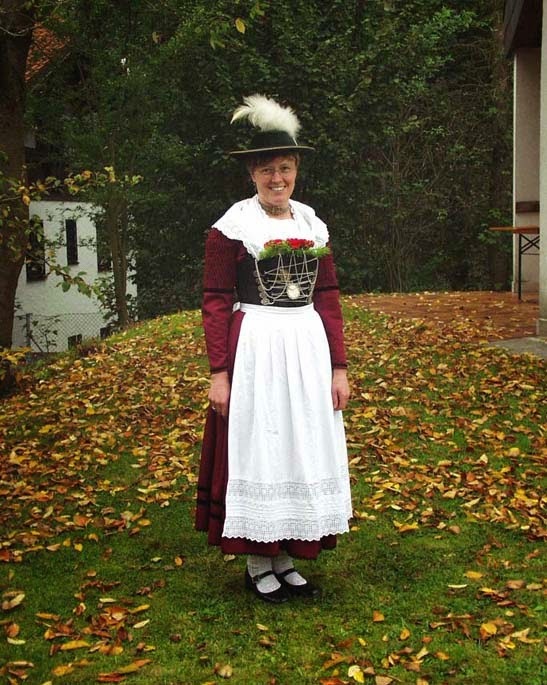 The reason that this version of the costume is called 'mit Weisswasch', is that it has a linen apron and shoulder kerchief. These are generally coupled with a hem length somewhere around mid calf. Bands of lace are inserted into both. 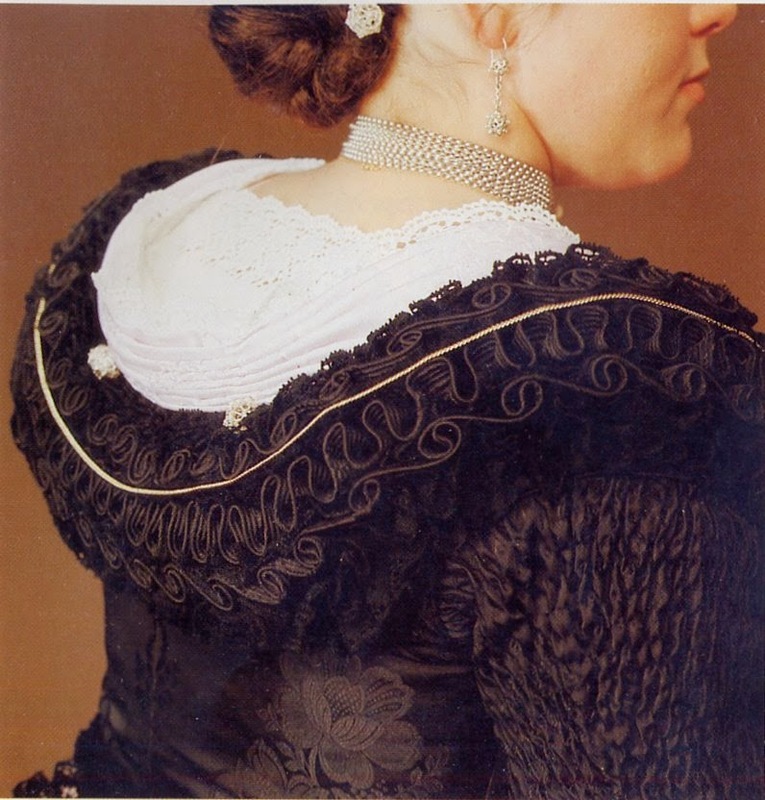 In this case, crotchet lace was used, but other types of lace, especially bobbin lace, may also be used. 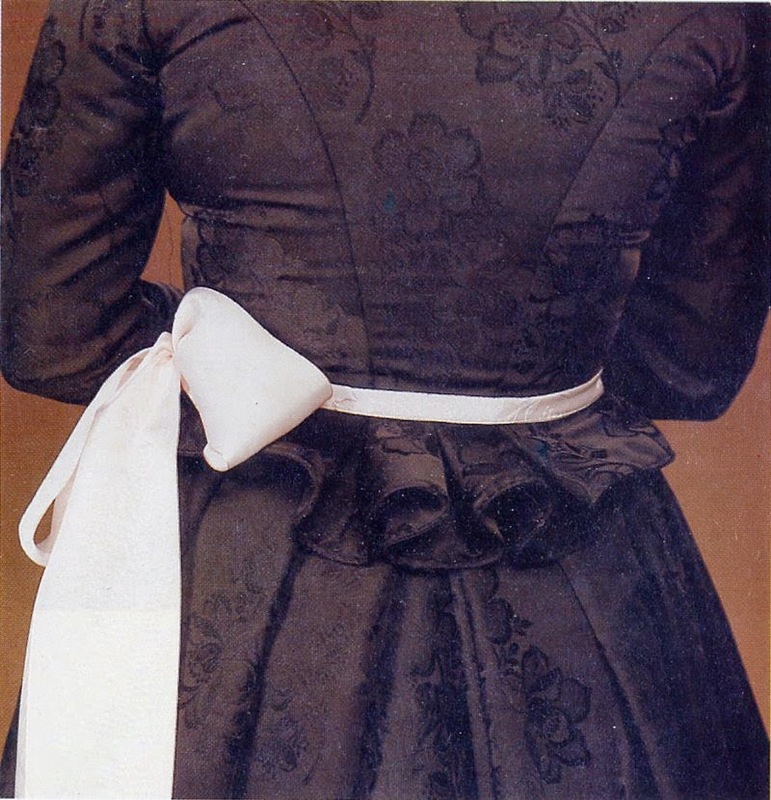 The apron is usually tied at the rear, if linen, and at the side if silk, but Kretschmer shows it being tied in front in his time. I do not know if there is any significance to this. 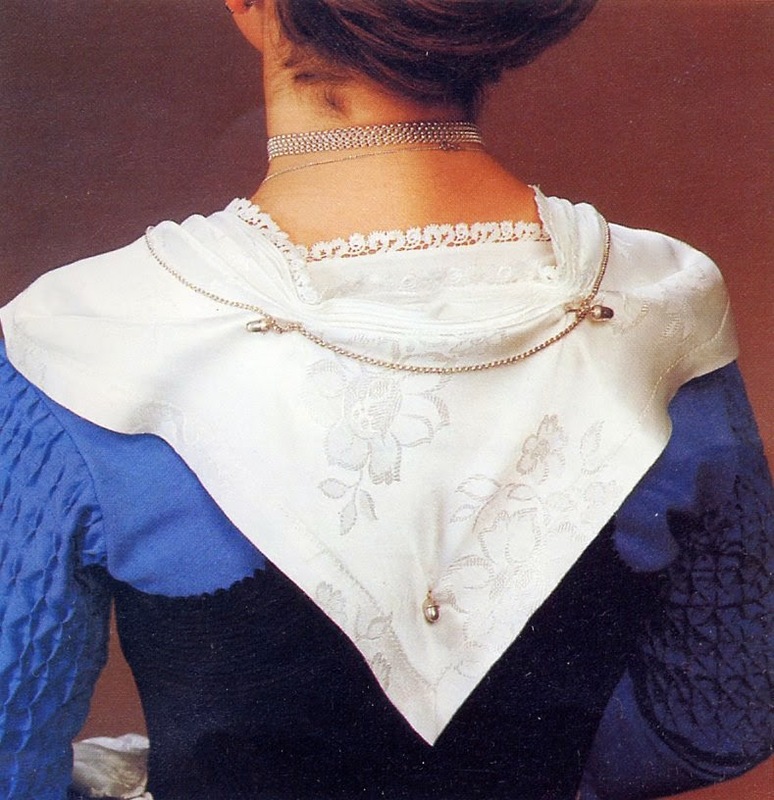 The triangular shoulder kerchief, Halstuch, is folded, the folds pinned, and then secured to the bodice with two pins in front, and one or three in back, the folds being designed to help it fit smoothly and to show off the lace. 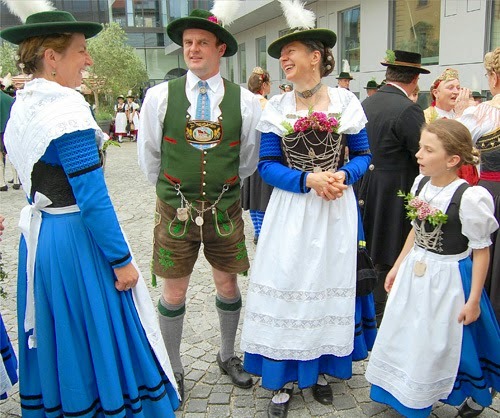 White or blue stockings are worn with this costume, and black leather shoes, earlier high button shoes, and today more likely lower ones 'halbschuhe', with straps. The hair is put up in a bun at the back of the head and fixed in place with filligree silver hair pins. A choker with several chains and a stone in the clasp is worn around the neck. Earrings are worn. 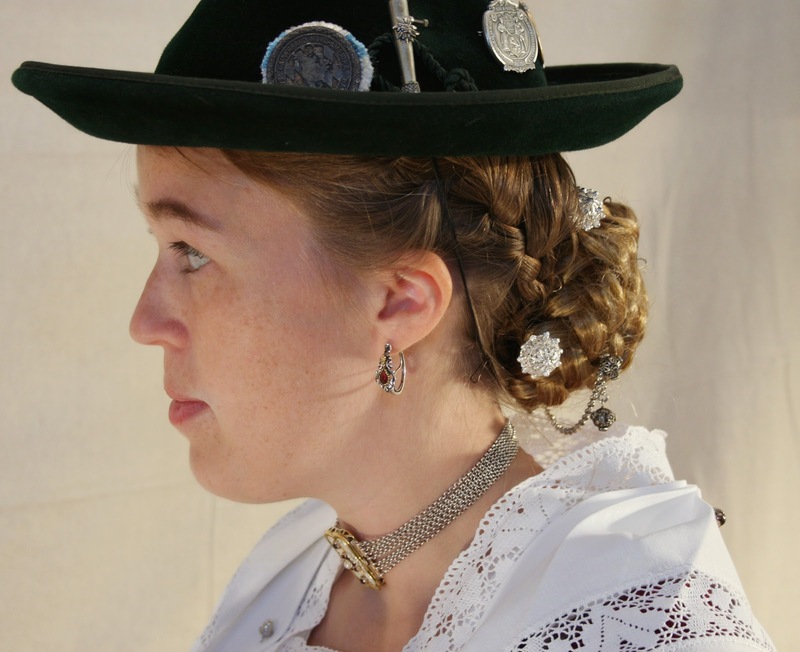 A rather low felt hat is worn, with a single row of matching cording, but having a feather or gamsbart pinned to it. A Gamsbart is a tuft of long hairs from the Chamois. 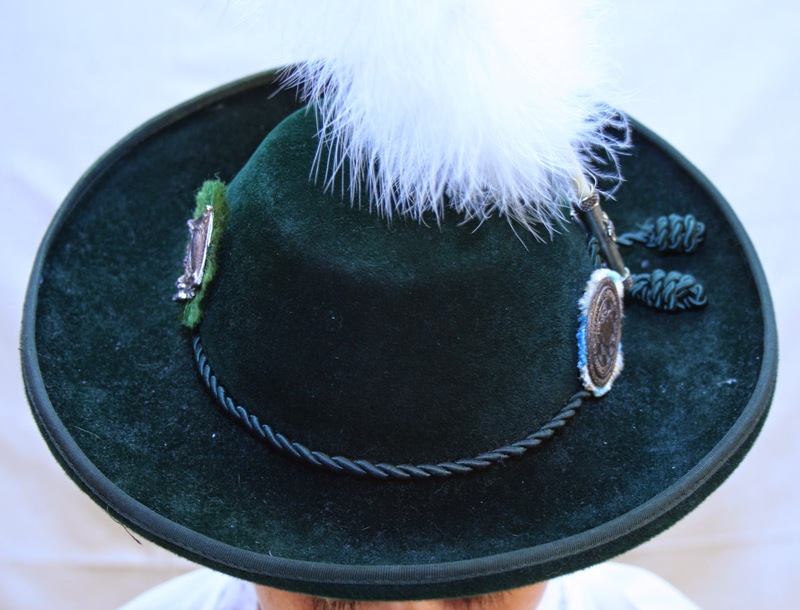 Small pins from contests or travels may also be pinned to the hat. 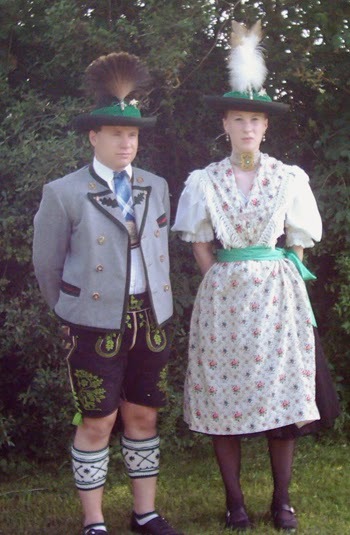 You will note that the hat is much shorter than the one pictured in Kretschmer. Often a short chain is attached to the bottom two hooks on the Mieder, with various charms hanging from it, Old coins, bird's feet, animal horns, etc. In some cases, they are also attached to the lacing chain. I will quickly introduce some of the other versions of the costume. This is very similar to the above costume. 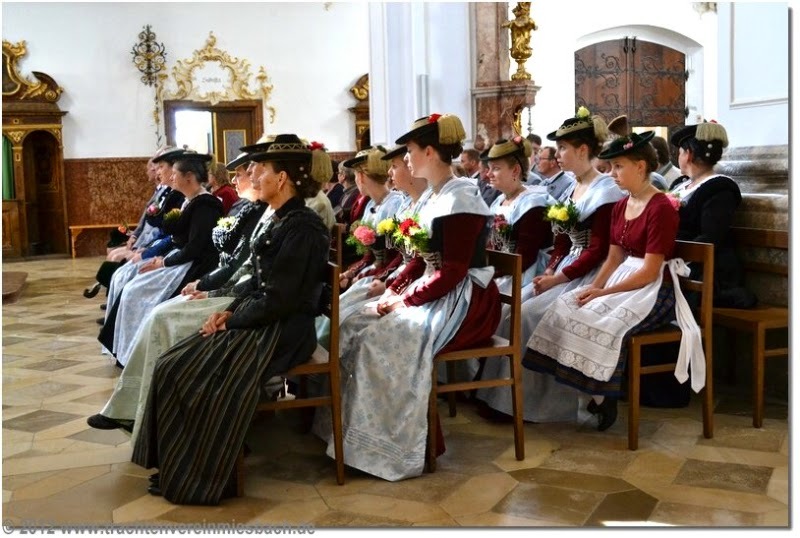 It is more for married women but is also worn by unmarried girls for more formal occasions, such as high Church holidays. It is distinguished by a longer hemline, around ankle length, silk apron and shoulder kerchief, and a hat which has gold cording and tassels. 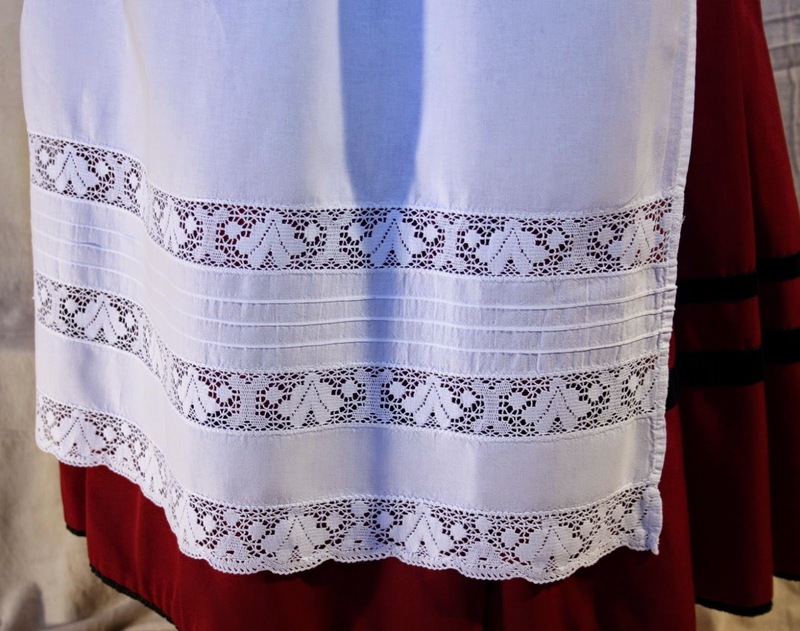 This is worn to Church, in some places most Sundays, in others only on the more important Feast Days. It is made of silk in black or some other dark color. The skirt is longer, almost floor length, there is no shoulder shawl or bodice, The upper body being covered by a jacket with a peplum. The hat is also plain but rich. 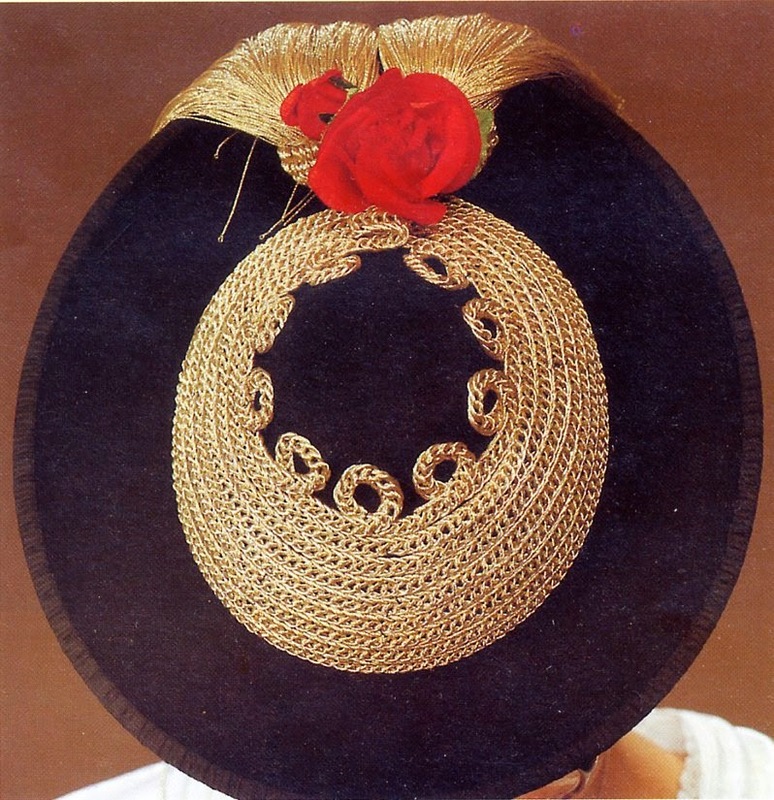 This is generally worn only by married and older women. 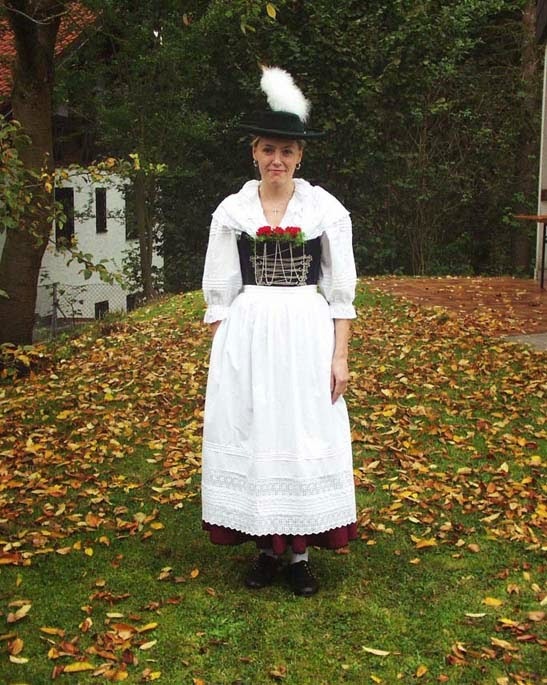 This is the most formal version of this costume, and many country women wear it for their weddings. 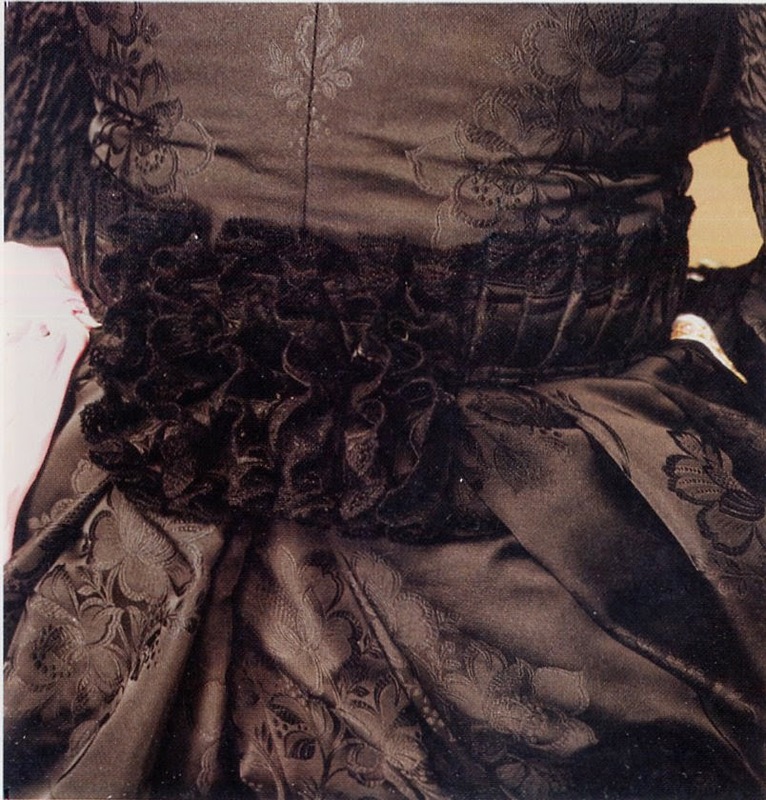 It is made of black silk, the collar and back edge of the jacket are ornamented with ruched black silk ribbon and lace. 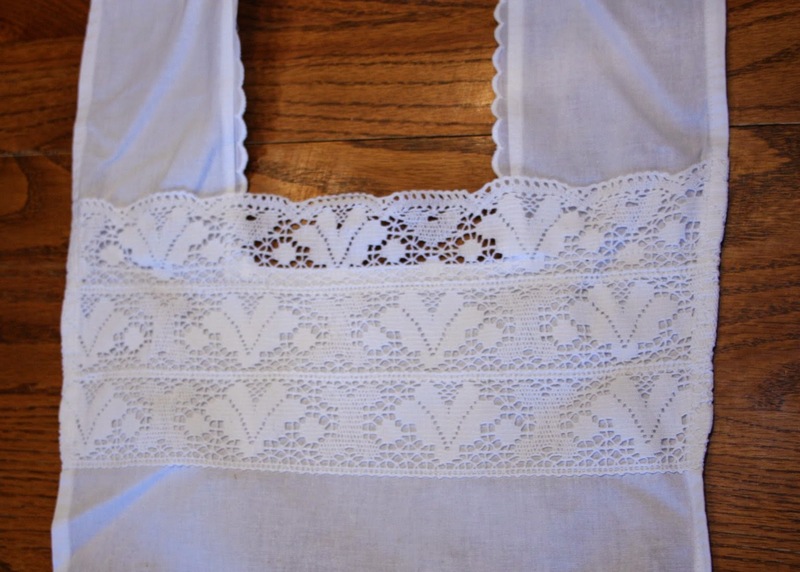 The upper sleeves are smocked, and there is lace on the cuffs. The skirt is floor length. 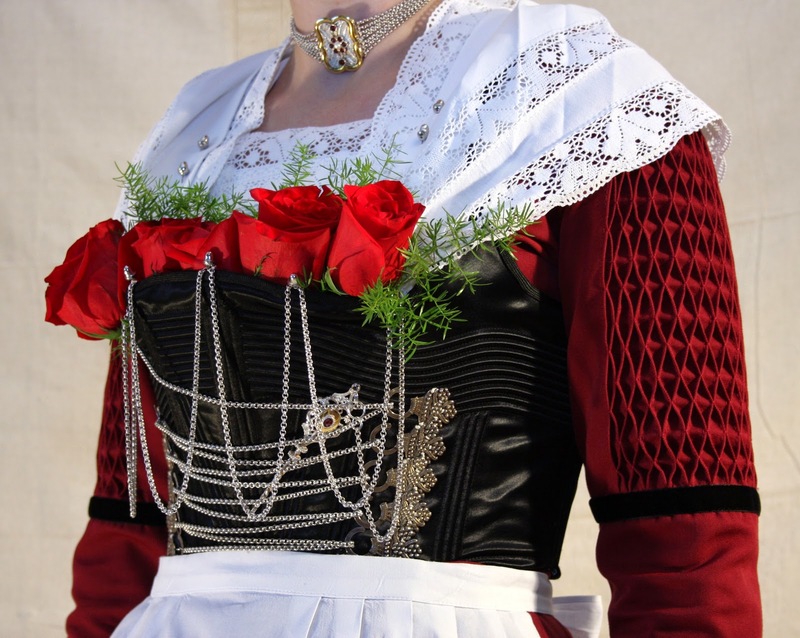 The Schmiesl is worn underneath, along with a much folded fichu which is pinned into place. 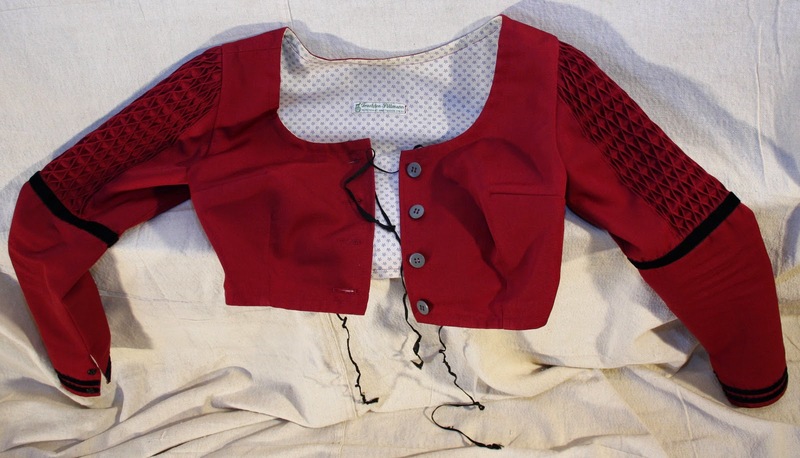 It fastens down the front with silver filligree buttons. 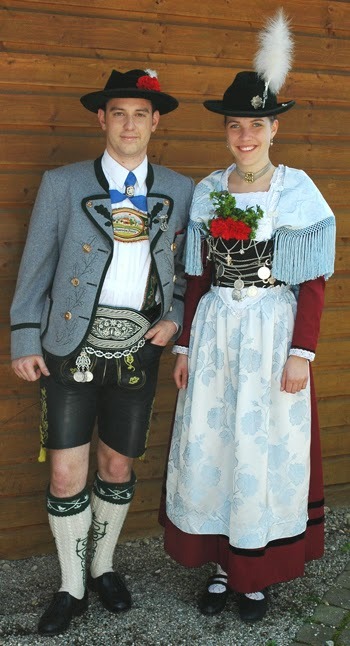 A less formal version than the Gewand with Mieder and Weisswasch is sometimes known as 'Halbtracht', or 'half' costume. 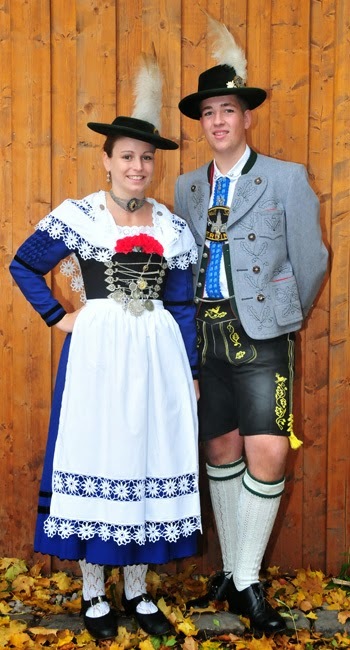 It replaces the Schmiesl and Janker with a short sleeved blouse. This is often worn by younger girls, and many groups prefer to use it for dancing, as it is cooler and provides more freedom of movement. One can make this even more informal by replacing the formal boned bodice with a soft bodice which buttons in front. This is particularly suited for dancing. 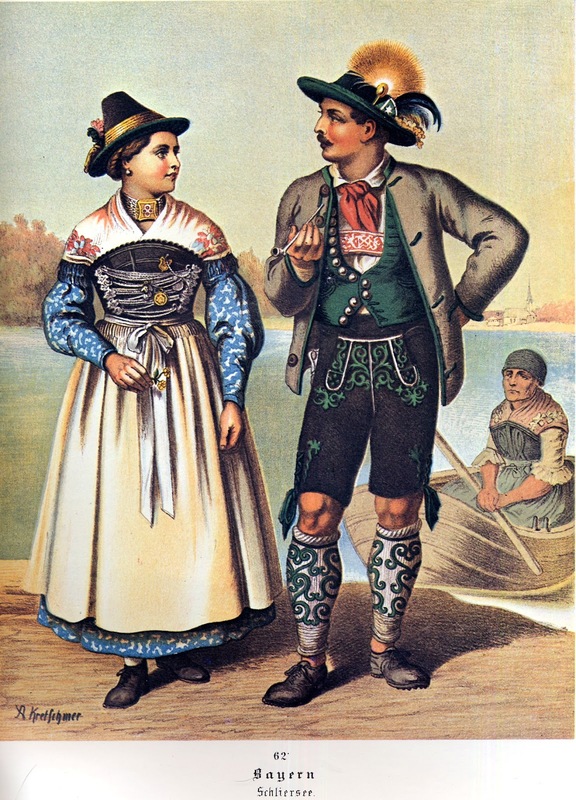 You can see this type of bodice in the Kretschmer print being worn by the older woman in the boat. 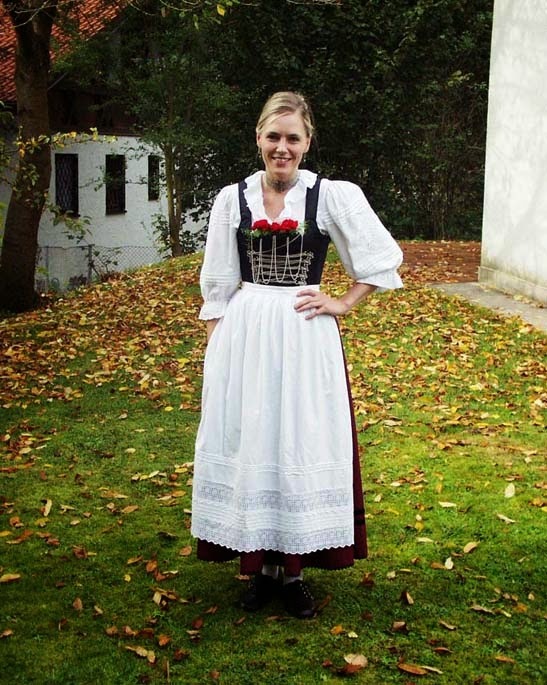 This has almost become a dirndl, which is the everyday costume.. There are a couple more versions, but I will end the article here. I will cover the men's costume in another posting. 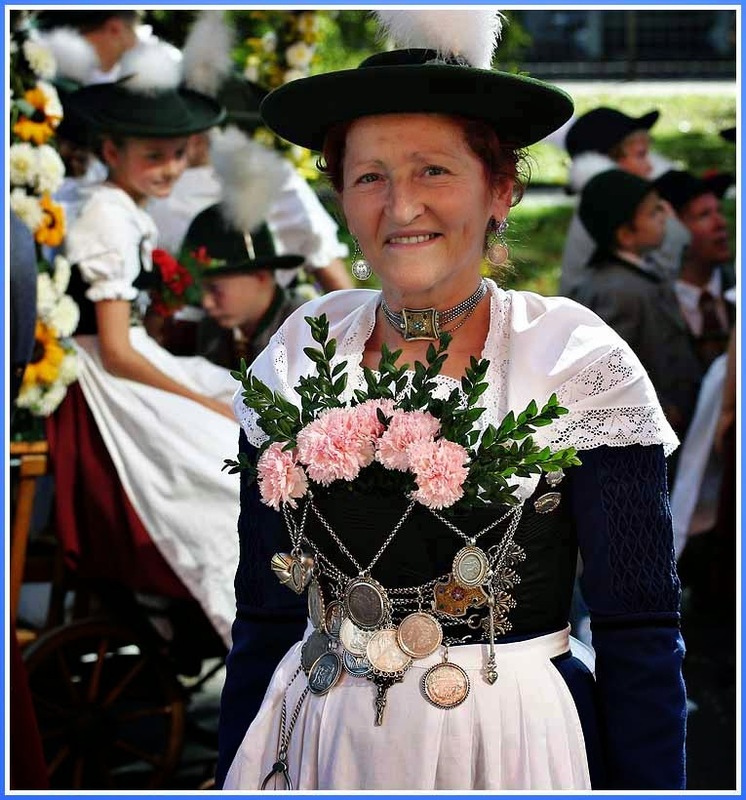 This costume is part of a larger costume complex native to the mountains of southern Upper Bavaria. 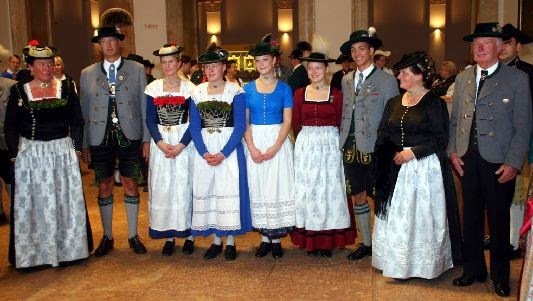 For context, here are some images of other Upper Bavarian costumes. 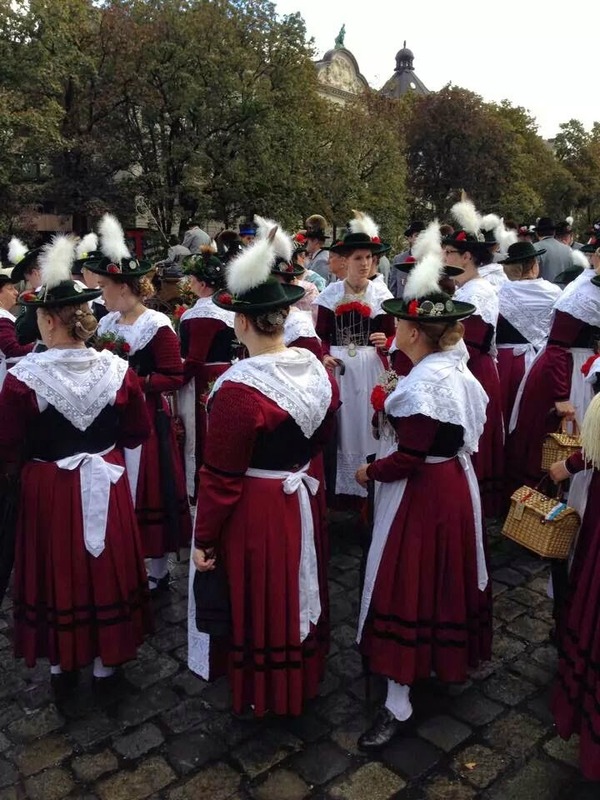 Here are some images of costumes which are of this complex but not Miesbach. 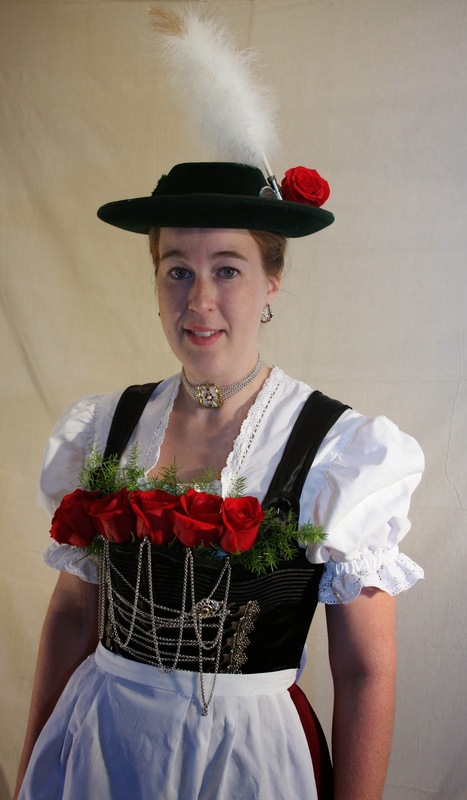 The Miesbach costume never has fringes on the shoulder shawl. I am not certain which of the above they represent. 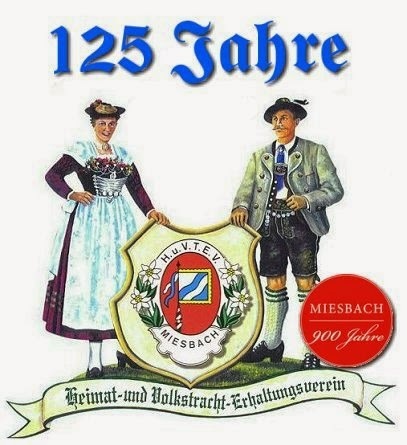 I believe that all of the following images are of the Miesbach costume. I'm not sure where the man in this image is from. 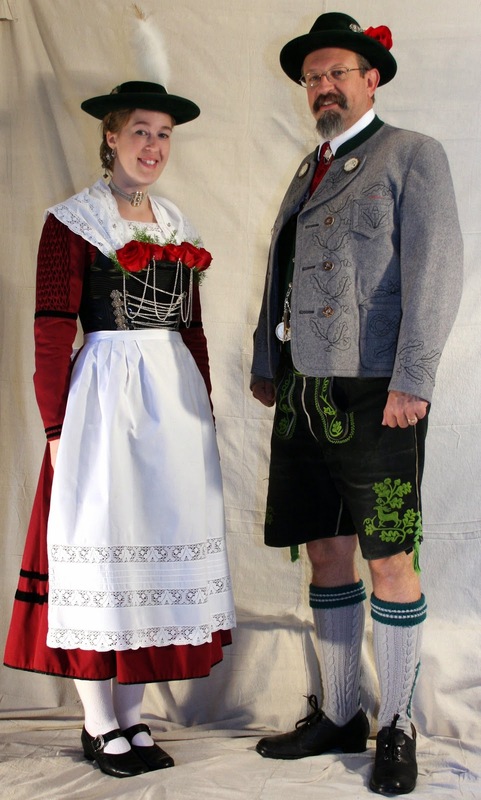 Many thanks to Orest and Sara and the Omaha German American Club. 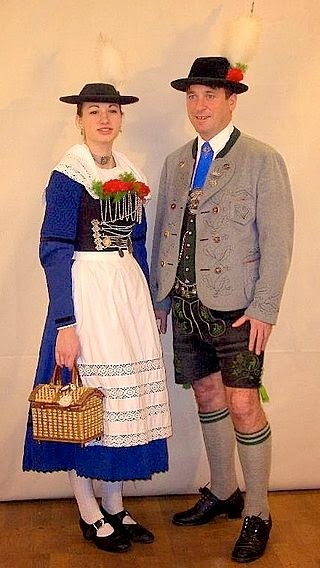 Questi abito cercando così bella e si vede la loro tradizione anche .. Grazie per questa meravigliosa post .. Enjoyed you article. 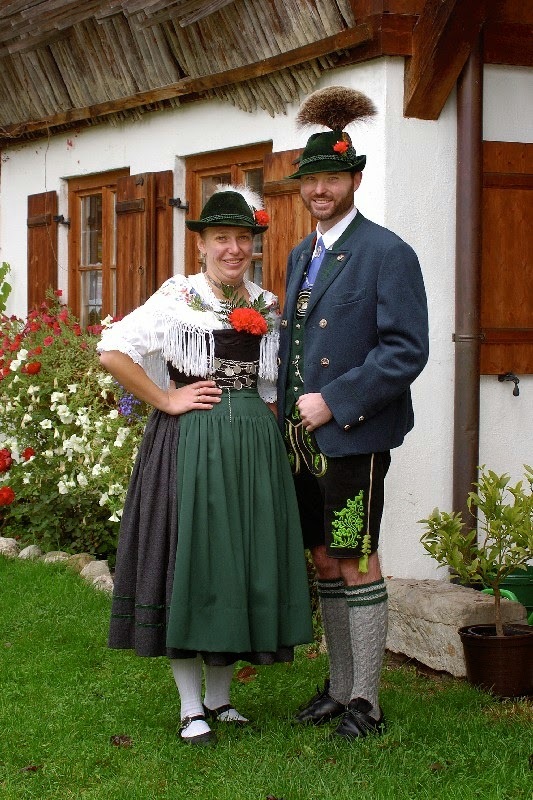 I bought a used pair of lederhosen in Munich in 1960. Used them until undersized. I prefer bunthosen and have several pair now.